Fantasy Scroll Magazine is an online, bi-monthly publication featuring science fiction, fantasy, horror, and paranormal short-fiction. The magazine’s mission is to publish high-quality, entertaining, and thought-provoking speculative fiction. With a mixture of short stories, flash fiction, and... read more micro-fiction, Fantasy Scroll Magazine aims to appeal to a wide audience. The magazine is open to most sub-genres of science fiction, including hard SF, military, apocalyptic &amp; post-apocalyptic, space opera, time travel, cyberpunk, steampunk, and humorous. Similarly for fantasy, we accept most sub-genres, including alternate world, dark fantasy, heroic, high or epic, historical, medieval, mythic, sword &amp; sorcery, urban fantasy, and humorous. 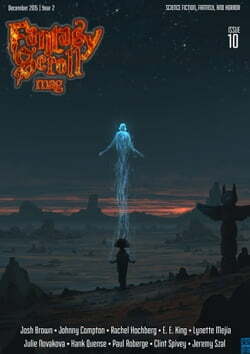 The magazine also publishes horror and paranormal short fiction.